Alternative containers for wine are all the rage lately. Boxes, bags, pouches and kegs are all getting their turn to show how well they keep the wine, and how well they fit into our lifestyles. Flasq Wines comes from Napa Valley-based JT Wines, and they are showing their mettle by packaging their wine in metal. Their aluminum bottles are 100% recyclable, quick-chilling and they are great for taking wine on the go, since they won't break. Flasq says their 375ml bottles chill five times faster than glass bottles and they leave a carbon footprint 35% less than glass since the cases are so much lighter to ship. The bottles are lined so the wine does not experience contact with the aluminum, and no light gets into the bottle, helping to further preserve the wine inside. The bottles were launched in January 2011 with Merlot and Chardonnay sourced from Monterey and San Luis Obispo Counties. Now Flasq has released Cuvée Blanc made with grapes from Alexander Valley. 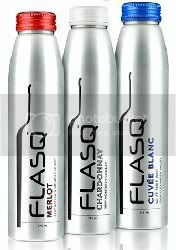 The Flasq Cuvée Blanc is 80% Sauvignon Blanc, 19% Viognier and 1% Moscato. JT Wines' CEO, Tim McDonald, says that millennials have responded warmly to the new wine. He says, "Responding to the growing popularity of sweeter wines across the country, particularly the coined 'Moscato Madness,' Cuvée Blanc is an easy drinking wine with attractive varietal-specific complexity and rich flavor for which our customers have been asking." Flasq wines sell for around $7 per 375ml bottle.